Change is always super hard! But try major overhaul to a centuries long (1858 to be exact) tradition at one of the oldest institutions in this country — the Army — and you quickly become unpopular. Efforts to evolve entrenched standards always stagnate at first. However, with a few folks like General Mark Milley and Secretary Mark Esper at the helm willing to break some china, and a growing number of young people unfit to become soldiers, wheels are in motion to pilot a new skills-oriented combat readiness and fitness test. Kudos to these leaders for continuing to kick tires on this. There’s no substitute for stubborn persistence when it comes to behavior and policy change on issues like fitness standards. The same was true of allowing women to serve and lead in infantry and armor units, and Ranger training. Finally, there was no reasonable argument remaining to ban females who meet the same standards as males from leading combat arms units. (BTW: have you seen these badass soldiers?!) But it takes a while for culture and precedent to catch up to practicality and metrics. We’re human, after all. Reflecting on my own path in the military, I chose the Engineer Corps precisely for the likelihood of leading a platoon as a female in a combat support role. At the time I branched in 2001, there had been rumblings about women in combat arms branches for years, but it took another nearly two decades to become a reality. Now the military is both setting an example and setting new standards that should be praised and followed by other public institutions. At Fitfighter we are honored to work closely with candidates — men and women — seeking to join another of the most physically demanding professions — the fire service. Together we are making big dents in fitness standards across the ranks. Leaders such as Chief Hood in San Antonio and Derek Alkonis in Los Angeles have set a high bar for investment in both department level programming and national fitness standards, and they are sounding the alarm to others. Departments such as Phoenix, AZ have long been pioneers in first responder wellness, and I was honored to partner up with Kyle Herrig, Owner of Triplex Training in Chandler, AZ and Matt Long, Professional Firefighter, to offer demo steelhose circuit training for Phoenix area firefighters. I am thrilled to be involved in taking a page the Army playbook and iterating on national fitness standards for firefighters that increases readiness, improve performance, and optimize results. The NFL should have switched to the rugby wrap tackle a long time ago. It's equally as epic, requires more refined technique, and when done correctly, safer. In his televised announcement this past week football's top health and safety guy dropped a bomb that will change the game forever. My reaction was less shock and awe at the admission and more "it's about time and it makes practical sense." And, it doesn't need to hurt the viewing or playing pleasure of America's game we all love. As a lifelong rugger I'm biased on this issue, but it doesn't mean my conviction is less powerful. I'm going to stay out of the debate on whether and / or how the NFL knowingly suppressed injury data relevant to accurate reporting on this issue, and instead focus on my expertise -- tackling! As a former All-American fullback I've got a few of these under my belt. I'll take on any naysayer who claims the rugby tackle is less entertaining, less to ogle over, slower-paced, or any other negative outcome. It's the opposite! The "wrap" tackle as used on the rugby field pits a lone defender against a power runner at top speed and creates the same thrilling moment of high flying suspension (maybe more!) as a "collision" tackle (my term). The key difference in the two tackles is that the wrap maneuver changes the skill from a rigid impact to the head, shoulders, and skeletal structure to a fluid collision that turns and gives way into the direction of the offensive speed. It relies on the naturally anatomy of the human waist bend. The power in this skill is generated from wrapping the offensive player and allowing his or her forward motion to develop the tackle. The defensive player turns the shoulder into the tackle as he or she wraps (see photo). The landing can be rough and tumble, no doubt. But the ground impact is more consistent and keeps the head and neck more protected. Pete Carroll pioneered this tackling shift as Seahawks' Head Coach years ago but only a few folks seriously followed suit. But now the hype around concussions and research on their link to CTE have left the door ajar for an overhaul in this skill for the football field. I don't see any other way forward if we're going to continue with football as America's favorite sport and protect the athletes we so dearly love as heroes. What can the 1936 Olympic Team teach us? I'm obsessed with true tales of human grit and glorious victory these days. This holiday season has had me engrossed with Boys in the Boat, the Disney-esque narrative of the 1936 US Olympic crew's gold medal charge in the midst of a Hitler-run Berlin (think Million Dollar Arm meets Iron Will). My mom gave it to me a year ago and it sat on my bedside table. Now I'm propagating it's message far and wide. Turns out that 2016's buzzing trend, functional training, is an age old idea we're reinventing. We learn this from, among others, 1936 Olympic team member Joe Rantz whose life is profiled in the story. A century ago, Rantz and his Olympic teammates from Washington State embodied the functional training mantra. Their frontier youths as fishermen and farmers set them up for their inhuman stamina in a crew shell. Rantz's personal journey reminds us of the single most important lesson for elite, professional, and occupational athletes alike: cross-training diverse physical pursuits and pastimes optimizes our bodies and minds, no matter what level of athlete. Physical hardship across multiple activities, mediums, and/or sports develops the whole body instead of isolating requirements for a single pursuit. Functional training is an extension of cross-training that prepares the body for real movement requirements it faces. Hauling lumber in exchange for his daily meals by the age of 10, and living on his own at 15, Joe's prowess as a rower in one of the most grueling sports was fueled in part by a childhood of hearty physical work that prepped him for 3000 meters of sheer pain during any race. Ten years of salmon poaching, hunting, chopping, constructing, and hauling honed muscle mass and motor skills. They taught a kind of stamina impossible to build from single-sport or one-dimensional training. The Washington crews trained with functional activities like working the two-man bow saw on a giant tree trunk to mimic motions in the crew shell. University of Washington athletes demonstrating their own take on functional training. For the past 10 years there's been a growing prevalence of sport specialization early in adolescence. An obsession with getting the edge over the next kid has fueled increasingly intensive childhood training regimens in one sport. This narrows the activity base, squeezes out diverse physical activity, and makes whole body development more challenging. On Long Island, where I live and Fitfighter is headquartered, lacrosse is the obvious example of this trend. Year-round private and travel leagues outside of school environments are perceived to be all but required here if a young athlete wants a shot as a college recruit. But that trend is being questioned now. With the help of sports celebs like Abby Wambach (US Women's Soccer World Cup Champion) and Urban Meyer (Ohio State Football Head Coach) we're finally paying attention to the notion of 360 degree training like that of Joe Rantz and the boys of the Berlin Olympics. Wambach is adamant that it was her basketball training, not soccer itself, that made her the best header ever to play soccer. 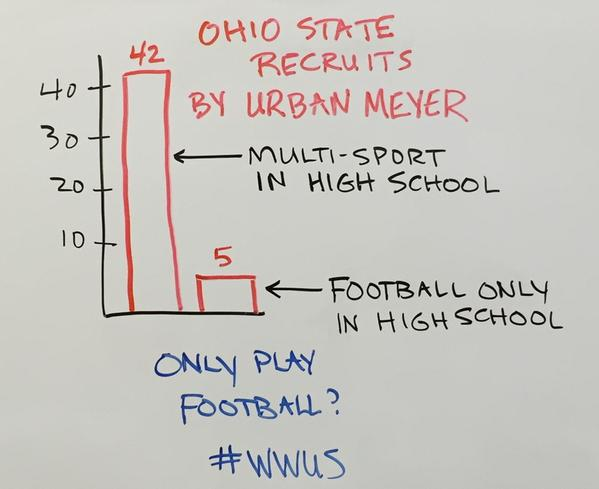 Urban Meyer recruits four times as many multi-sport athletes as football-only athletes, and Pete Carroll always asks what hobbies his players have, what else they do in their lives outside of football. Research on early specialization in young athletes shows that injury rates increase in one-sport athletes. Moreover, there is no indication that early specialization provides any advantage over having a diversity of activities until much later. In fact, a majority of top athletes did NOT specialize until later in their careers. As school-aged kids, many were recess junkies and multi-sport competitors like the rest of us. For occupational athletes such as firefighters, military, and law enforcement, Joe Rantz' lesson is directly applicable: physical training should be diverse in design, relevant to our work, and ranging in intensity. It should develop the whole body for the special athletic demands of our occupations. So my charge to all of you, in a toast to 2016: get out there and spice it up!! Pay tribute to those who have come before us, overcome all odds, and shown us how its done. Gather your troops, train as a team, pat each other on the back, ride a single-speed bike, pick up an oar, climb a mountain, run a road race, find new tools to inspire you, move your body in fresh ways. Overcome the inertia. Really fight for it. See Training tab for ideas to jumpstart your own cross-training program. This weekend in sunny Chandler, Arizona, a fitness collaboration 10 years in the making came together. I thought I’d share my reflections from this exciting success. Triplex Training performance center, Fitfighter equipment and celebrity firefighter Matt Long fused collective energy and commitment into a model for change worth spreading far and wide. Here’s what I learned from this experience about what makes partnerships impactful. We converged from three different angles — Triplex a performance training center outside Phoenix, Fitfighter a fitness equipment and program supplier from Long Island New York, and Matt Long a retired FDNY fireman and motivational speaker. We found that we shared a common commitment: to prepare you for what really happens out there. Whatever hits you next in your life. We found that joining forces, our whole is greater than the sum of our parts. A mutual friend connected me with Matt Long when I was looking for a partner to spread Fitfighter Training's message around the world. A 17-year veteran of the FDNY, Matt suffered a should-have-been-fatal bike accident, returned to life as an Ironman, and now preaches the power of will and importance of fitness for life to groups around the country. Our shared interests connected us. Matt had met Kyle Herrig, owner of Triplex Training, in 2007 in a time of desperation during a slow recovery. He was looking for someone to believe what he wanted to believe — that not only would he walk again, but he would run. Matt moved to Arizona, where Kyle helped him return to life as a much more than a runner: an Ironman. This summer, shortly before the 10 year anniversary of Matt's accident, we started to talk about building a collaboration with Kyle and Triplex. Matt wanted to return to Arizona to say thank you. He knew that Triplex and Fitfighter had something special in common. So we brought the troops together. We dreamed up a 2-day event for five Phoenix area fire departments and the general public. Each of our entities added its unique value to the events — eight circuits featured a new world class facility at Triplex, Fitfighter Steelhose equipment, and Matt’s story of the will to survive against the most extreme of odds. With a workshop-style intro, we relayed three simple principles for training fire ground movements. We emphasized training in three dimensions, using functional movements in a controlled fitness setting to prepare for whatever goes on outside the gym. Fire hose suicides, search operations, weighted burpies, hose carries, truck-height jumps, and ceiling breach repetitions rounded out a 10-minute intensive circuit timed by a boxing bell with 15 short seconds in between. Much like the fireground, we left little time to think. We’re training the body to be ready, and to react. In the end, Fire Chiefs, line officers, and crews are armed with a introductory playbook to bring back to their departments: three simple principles to govern training on eight fire ground maneuvers. The public got a taste of what it means to be the ultimate occupational athlete (TM): the firefighter. Let’s replicate this type of collaboration in the future!! Our industry is filled with momentum to connect professionals, training centers, equipment providers, motivators, and leaders of major institutions including the fire service and the military. We can use this demonstration-based model to bring together new disciples for our message. Finally, connecting the masses to our public service professions fosters support, appreciation, and interest for their extraordinary work. Smart collaborations generate tremendous value for our clients, our athletes, and our public institutions who rely on superior fitness training to protect themselves and our communities. Ideas and innovation grow from bringing competitors, friends, and industry experts together. There is room for all of us. Finally, stories like Matt’s spawn humility. They inspire all of us to dig deeper, reach farther, and demand more from ourselves and those we serve in our industry. As fitness professionals, we should hold them close, remind ourselves of them often, and share them incessantly. Here’s to our next big showdown! Stand by for more. It seemed like a good weekend to share Part 4 of 5 on the sports science of firefighting, since we had a house fire in Huntington Bay yesterday and a situational drill this morning out at Yaphank Training Academy. Been a big weekend for my small Long Island department! The intriguing thing about Ryan Harrison is that he's normal guy sized. At 6'2", 185 lbs, he's not an ultra-man squashing the tennis ball like an ant. He just deploys one of the most technically accurate and torque-filled motions in the business. What matters is not his size and muscle mass. Instead, the timing with which his racquet snaps at the ball, the speed of his footwork, and the movement of his hips and shoulders unleash his power and momentum that fuel the ball's speed and acceleration. I SloMoed this for you so that you can actually see it!! Moral of the story? Bigger isn't always better. In athletic pursuits, and industrial professions, often it is stamina, mental toughness, flexibility, stability under weight-load, and body awareness, over merely strength, that combine to create the best performers. This rule is paramount to firefighting. Under an average of 60 lbs of weight (and that's just wearable gear and O2 tank), the biggest guys suffer. Hauling charged hose line up 2 flights of stairs and around a corner, staying low on hands and needs, prove onerous for muscle men. I might be biased standing at 5'3" 130 lbs, but you should take inspiration from that! When you're not able to solve challenges with muscle, you must get smarter, more efficient, and more stable. These guys aren't defensive linemen. They employ the strongest muscles in their body, balance, a simple harness, and the rules of physics and leverage to pick up weight and travel distance with it. I once met an appliance delivery guy in Colorado who was amped about losing 40 lbs once he took the job. Good for you man! My final example of the "bigger isn't better" mantra is the concrete karate chop. The same concept applies here. This guy is not heftier than your average joe, but his power to perform a specific task knows know bounds when he combines technique, focus, body positioning, and timing. Another set of GIFs showcases the same for raising a ladder, hoisting a ventilation and overhaul tool, tackling a flight of stairs on air, and performing search team maneuvers. When you watch a truck team on the fireground, it quickly becomes clear that bigger isn't better. Sure, height helps with ladders and pike poles, and muscular strength helps to hold forcible entry tools and stabilize hose lines. But stamina comes from smart management of your body and the weight it's carrying. And that opens the door to anyone, of any size, who's committed to training it! The Sports Science of Firefighting: A 5 Part Series. PART 3: Firefighting's silent devil is repetitive motion injury, which occurs over time and is difficult to diagnose until it's late in the game. The good news: with strong, progressive, skills-based training programs, these injuries can be reduced or prevented altogether. My most recent injuries include a busted biceps tendon in my shoulder (read: run in with a tree onskis), strained calf muscle (post summer triathlon), and that nagging hip pain I get with long distance running (wish it would go away). While these injuries have caused me similar discomfort, turns out each of them have unique treatments and preventions, ranging from shoulder surgery to Active Release Technique (ART)to yoga and foam rolling recovery. Fire ground maneuver requires firefighters to go from zero to sixty — hauling hose, breaching doors, pushing, pulling, venting, climbing, heaving — over and over and over. Professional athletes do the same — thrashing their muscles, ligaments, and tendons again and again when they play their sport. But firefighters play their sport loaded with 60 lbs of weight in gear and tools, and they definitely don’t indulge in the perfect warm up (ever). Weight load exacerbates and magnifies common repetitive motion injuries such as tendonitis, IT band syndrome, rotator cuff strain, and stress fractures. This makes firefighters especially prone to overuse problems, and makes fireground-specific training critical to long term health. Additionally, risk is compounded for overuse injury, says Dr. Allison Arensman, Orthopedic Surgeon at Dartmouth Hitchcock Medical Center. She notes that “there are...jobs [and] behaviors that put people at risk — sudden increase or new activity, poorly designed [or not ideal] work environment or equipment — but there also seem to be people who are anatomically predisposed to such injuries or maybe even just more sensitive to the symptoms.” Dr. Alaia agrees, describing this risk as a perfect storm of "extrinsic and intrinsic factors." He says that an athlete's internal anatomy, “such as alignment and arch height”, and conditions external to the body, such as sports mechanics and training intensity, combine to cause damage to tissues. This all sounds depressing, but there’s great news! Dr. Alaia reminds us that “the best ways to prevent overuse injuries are readily identifiable and can easily be altered. Making small changes in equipment, sport mechanics, and training regimen can go a long way.” He cautions that starting or shifting any regimen should be gradual. In addition, the body must be trained for specific skills that you want it to accomplish — advancing charged firehose, crouching and crawling during search team operations, carrying a victim down a flight of stairs, stabilizing a 50 lb hydraulic extrication tool… you can fill in the rest. That’s where we come onto the scene. We’ve done the heavy lifting (pun intended and proud of it!) for you. We’ve broken down the fire ground into 8 simple maneuver areas and studied the key physiological risks within them. And we designed basic training to prepare you for this work. Our Steelhoses and circuits provide a one-stop shop to train skills-based movement with graduated weight-load. Whatever your program, most important is to get out in front of risks and injuries before they man-handle you and your team. This way you can focus on fighting the fire and not your body! Recommended Sports Medicine Reference for Overuse Injuries: American Orthopaedic Society for Sports Medicine (AOSSM). Part 2. "You are what you make yourself into." In his New Yorker page-turner about “the performance revolution” in sports over the last half century, James Suroweicki argues for infusing the sports science analogy into all professions and activities. He tells the story of an NBA forward in the '70s who went from a college superstar to a near drop-out in the pros. Being giant and athletic carried him through minor league play, but athleticism alone couldn’t cut the mustard against the rest of the best in the nation. That’s when he met Pete Newell, who eventually became the go-to man in basketball for skill-specific training. An evolution over the next 3 decades arrives Suroweicki at a simple conclusion: 50 years ago, the thought was that you are what you are — gifted or not. But "today in sports, you are what you make yourself into." In 2015, athletes from high school age onward carve themselves into sport-specific machines with the help of strength coaches, sprint specialists, nutritionists, play coordinators, engineers, and so on. Nano-seconds matter (think Olympic Downhill) and inches separate winning and losing (think Superbowl). There are pros and cons to this movement. The cynical version is that this pressure for perfection is putting unfathomable burden on kids from too young an age. As a former kid-gymnast turned collegiate athlete, and future parent, I get it. But the flip side is that this human quest to be "better all the time" teaches people important life lessons about hard work, competition, risk, and success. Now, it's not just the born-gifted guys who hold the trophies. It's anyone who steps up to the plate with a brain, a work ethic, and a team. And it defines how as firefighters we should approach the most blessed burden of all: the opportunity to save lives. My belated run-in with this article was timely. It affirmed my message about firefighter fitness training: your power to perform in that fateful moment comes from how you prepared in all the moments before. Fighting fire is the ultimate sport — it’s a fierce, timeless contest between industrial athletes, loaded with 50 lbs on their back alone, with another 50 lbs of tools in hand, on a vertical, concrete field, against a relentless, tireless, and uncontrollable opponent. Unlike most athletes who focus on a narrow set of skills with a single tool (except, perhaps, pentathletes), firefighters must be masters of many crafts on a playing field that constantly changes. They haul long lengths of water-charged hose, stabilize off-balance weight while operating hydraulic extrication tools, crawl in low-motion positions (all but blacked out), and climb endless sets of stairs. They position 4 story ladders, hammer repeatedly into roofing materials, carry human victims out of windows, work in search and rescue units, and move in buddy teams to advance hose line. All this while communicating, managing, and organizing through the chaos. I got your back and you got mine. I’ll save your life and you’ll save mine. For those who toss the word around too lightly, that’s what “brotherhood” really means. It means a commitment to be better all the time for each other and for our profession. PART 1. What a total spectacle last Sunday. Butler and Brady and gang. I was rooting for the Hawks — as a Raven’s fan born and bred, I’m anti-Patriots rather than pro-anyone else in that Superbowl matchup. So I can recount more Wilson / Mathews / Lynch plays despite the torturous ending. My pain aside, it got me to thinking about the FOOTBALL-FIREGROUND analogy. It's an easy jump to make. Sure, one is a game and the other saves life, limb and property. In one the goal is to put up points and the other to put out fire and find humans. But the sports science and teamwork of football is as good an analogy as any to the physiology and unit-based maneuvers on the fireground. Days later after the Super Bowl, that deep sports obsession I have lingers in my bones -- the high speed tackles, big acceleration through the pack, ball tucked tight under the arm, team trust, and earth shattering, history-making gambles like Patrick Kearse bobbling the ball in slow motion a few feet from the goal line. Sport-specific trainers start with key maneuver areas -- cutting, passing, tackling, blocking, catching. They develop ground rules and circuits that correlate directly to those skills. Governing principles include change of direction, acceleration, and technical ball handling, as examples. In the same way, we start with 8 fireground manuever areas that encompass most of what we do in this profession -- including hose handling, ventilation, search and rescue. When we isolate atypical weight-loaded muscles strained in these maneuvers, we reveal the governing principles of firefighting: Low-Motion, Weight-Load, O2 Burst, and Unit-Based Fitness. When I break down the physiology, football and firefighting have common ground rules: bursting, staying low, balancing under load and in motion, and operating as a unit are fundamentals in both professions. They are governing principles for every position on the field, and every slot on the hose line and search team. Granted the key maneuvers are different. But in both cases success relies in outlasting the opponent -- the Hawks or the fire -- and the ground rules are the same. ZERO TO SIXTY bursts of a receiver or ladder climb require that the heart is strong and Type II fast twitch muscle fibers trained. LOW-MOTION MANEUVERS — the snap or the search — demand glut stability and powerful core. BALANCE UNDER LOAD AND IN MOTION is the mantra for success for the catch of the century or the advancement of a hose line. And finally, THE UNIT. Fitness training should be oriented around the team. We fight fires as a team, play superbowls as a team, why wouldn’t we fitness train as a team? This doesn’t mean every workout must be unit PT. But professional circuits that we're using to close the gap between fitness and the fireground should be facilitated team events, and made mandatory as needed. After all, MVPs only surface on the shoulders of giants. At FITFIGHTER we hail from the military. Every morning at dawn Army units form up for PT in the yard, at the barracks, on the obstacle course, at the foot of a mountain, or wherever that day takes them. Fire Academies share a commitment to unit PT. Depicted below, at FDNY's Fire Academy at Randall's Island candidates start the morning with weight-loaded plyometrics and intervals using our STEELHOSES. Research shows that fitness training in units rather than as individuals makes athletes push limits further and stay motivated longer. Most of us would agree that having someone waiting in the gym or on the track is a good way to ensure a high intensity session happens that day. At Halesite FD on Long Island, where Sarah Apgar is Director and Trainer, we do team weight-loaded workouts Wednesday evenings and Sunday mornings, and guys supplement with their own programs throughout the week. Peruse our top 5 benefits of "more hands on deck" exercise, and give it a shot in your own firehouse! (2) Timing: having multiple athletes work together at an exercise increasing consistency and accuracy of everyone's count and timing. Intervals are smoother and more standard. (3) Learning / Innovating: 2 heads are better than 1. Learn from your colleagues / teammates / fellow firefighters when they have a new take on an old routine. (4) Stamina: when you're getting weary, other people around you provide distraction and motivation and increase your stamina to get to the finish line. (5) Mutual Example: while training weight-loaded movement, critical elements should be watched such as form and body positioning, low squats, flat back, and the use of bones and joints for strength and stability (vs. muscle, which is not as strong). Workouts in teams enables this to happen during the workout.